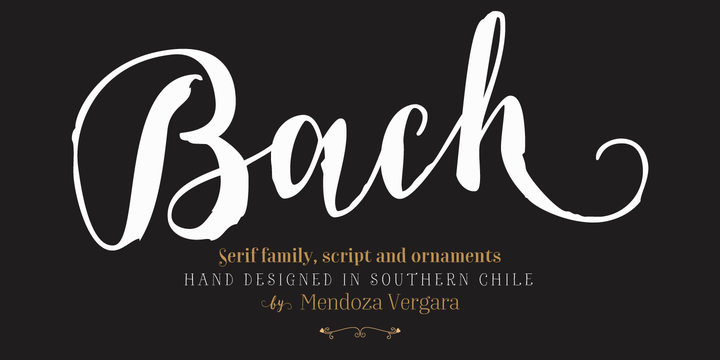 Bach is a hansmade typeface created by Mendoza Vergara and published by Los Andes which comes in two styles, a Serif version of Garden font with 6 weights and italics and Script (Regular & Bold) plus floral and borders. With a natural look, Bach inspires you to get back to the nature. It is perfectly for packaging, poster, illustrated books etc. A font description published on Thursday, July 28th, 2016 in Fonts, Los Andes, Luciano Vergara by Alexandra that has 2,909 views.